is the main character of the story as well as Kyu, his best friend. 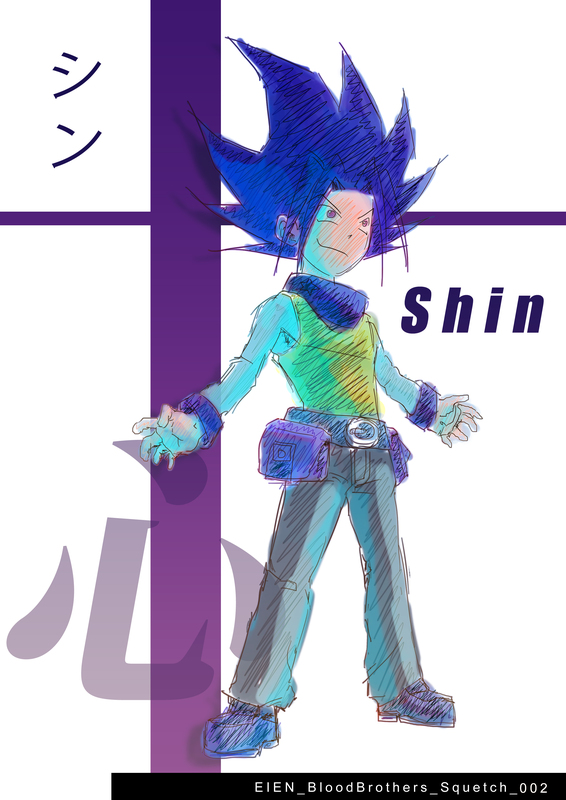 12 years old at the beginning of the story, Shin’s extreme kindness will help him to make new friends prety easily. He loves manga and possesses a relatively high physical strength due to the fact that he is often late to go to school, and ends up fighting against Gaya and her father. Shin’s excuse for being late is that he’s lazy and really bad at running. But he actually couldn’t make up with a better idea to get closer to Gaya. He loves Gaya since the first time he met her (a day he was truly late to school). Shin created the K-Ball alongside with Kyu. Ba, j’arrive pas à saisir en quoi le fait , pour les 22 perso d’être constammt en retard, puisque tu insistes dessus, est un atout dans l’histoire, un moteur? Il me semble qu’il manque à ce début, un enjeu motivant les lecteurs nouveaux à se montrer curieux de la suite.